Referred or known as Mumbai’s Famous Jain Temple which is located at Walkeshwar Teen Batti area, Malabar Hill. It was built in 1904 and is now considered as Tirth place of Mumbai which is visited by ‘Jain Deravasi’ Community who believes in a different type of rituals compared to other Hindi temples. They do not offer flowers to their God/Goddess in any of their there jain temple as there may be small insect that might be present inside flowers/petals they offer and might get killed. Their is another jain temple called ‘Chandanbala Jain Temple’ at walkeshwar road, Yet the main temple we talking about is at Shripal Nagar, since 1970 dedicated to Mumbai’s first Jain Tirthankara called Shri Adinath bhagwan (God) at Harkness Road, Walkeshwar. It is located at Famous Walkeshwar (Malabar Hill), Ridge Road close to famous ‘Hanging Garden‘. To reach one needs too take a Taxi/Cab From Charni Road Station (West side), or Either From Grant Road Station West, It takes 15 to 20 mins to reach and taxi fare should not exceed Rs.50. Alternately bus services are also available for Malabar Hill/ Walkeshwar area. 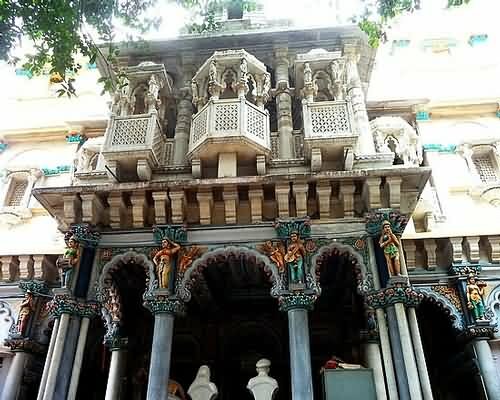 This Jain temple ( Also called ‘Derasar’)of Mumbai is specialized for there old carving work and beautiful architectures, colors, Paintings etc. People who follow jainism are peace loving, friendly and very social which you will find and admire inside this temple. Identifying a jain person in city is very easy, They apply sandalwood tika on forehead upon visiting such temples or at home too throughout Mumbai. They wear special dhoti(a kind of wear) and go bare footed to jain temple. Jainism is also famous for there strict diet following rules scientifically good for health. Hanging Garden and Kamla Nehru park are 2 famous gardens adjacent to each other in same vicinity. They are the oldest green grass garden at Walkeshwar. Read on the articles to know why it is named as ‘Hanging Garden’ which has a lovely View Point from where you can see a beautiful Girgaum Chowpatty view, It has Children Playing boot/shoe House. Another spiritual place being ‘Banganga Tank‘. It is an heritage and Oldest sacred fresh water tank (called KUND in Hindi language) for Hindu rituals. Similar famous jain temples of Mumbai are Agashi Temple Virar and Mahavir Dham at Virar.